Fair pay for Camden NSL workers! Homepage for the campaign for fair pay for outsourced traffic wardens at NSL in Camden. 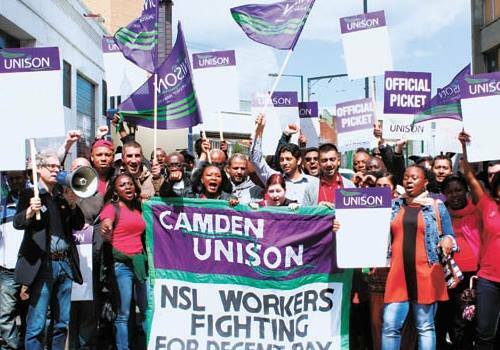 Camden NSL workers made over £24 million profit for Camden Council last year and contributed to NSL’s £18 million plus profits for the same period. John Mann, Branch Organiser, outlines why they are now embarking on balloting for strike action. Back in 2012 UNISON members who work for NSL – Camden’s parking enforcement contractors – took strike action in pursuit of better pay and conditions. Those strikes achieved a three year settlement with annual pay increases of over 3%. However 3% of very little is not enough to lift you out of poverty so this year we submitted a claim that would take basic pay from £8.92 an hour up to £10.50. After months of exchanging offers and counter offers we have reached an impasse. The final offer made by NSL is to pay CEOs (Civil Enforcement Officers, the new name for Traffic Wardens) 12p above the current rate of London Living Wage which currently stands at £9.15 thus placing the lowest paid staff on the Parking Contract on £9.27 an hour. As a compromise in order avoid the need to take industrial action we offered to settle at £9.50 an hour with a view to gradually increase the LLW ‘plus payment’ over subsequent years. This offer was rejected by both NSL and Camden so we began an official ballot for strike action. Members voted overwhelmingly in favour of action, with 89% in favour on a turnout high enough to fulfil the proposed Conservative anti-strike legislation. Working as a CEO is a hard and dangerous job. You work in all weather conditions and have to put up with regular verbal abuse and all too often physical attacks. In return you are paid badly and receive very little support or respect from your employers or members of the public. CEOs have to gain qualifications which cover the intricacies of parking law and the other requirements of the job. They rightly feel they deserve to earn more than 12p above the current minimum wage needed to survive in London. This entry was posted in Uncategorized and tagged living wage, NSL, pay, strikes. Bookmark the permalink.